You never know when you will get the chance to have a Chick Night. It could be the result of weeks of planning and organizing. Or, you could have a spontaneous Chick Night that none of you saw coming! Last weekend, I managed to enjoy BOTH of these extremes. On Saturday afternoon, Bonnie, Collette and I met at Bonnie’s house for some pre-planned chick time that involved a raw veggies platter with three types of dip, a hot cheese dip with four kinds of crackers, a fruit platter and two dips – one being a lovely serving dish brimming with melted chocolate – and a Chick flick. The three of us spent a hilarious 90 minutes watching the movie Mamma Mia on DVD. Yes, we chose the Mamma Mia Sing-a-Long option. Did you really have to ask? After the movie and snackies, we had a nice, long chat – the kind that involves each woman being able to get caught up on what is happening in the other women’s lives. On Sunday afternoon, I packed my trunk full of the various leftover goodies, added a portable chocolate fountain, and drove across town to meet reporter, Jenny Jelen and cameraman extraordinaire, Cliff Skelliter to tape an upcoming segment for a local cable show on Eastlink TV called, The Episode. When the first words out of Jenny’s mouth were, “Glad you’re here, our makeup and hair woman is ready for you”, I KNEW this was going to be FUN! How often do I have someone else do my hair and makeup for me, you ask? Hmmmm, let me think. It happens about as often as people offer me free trips to the Caribbean! I am amenable to that suggestion, by the way. When Christine had finished with Jenny and I, it was time to set up the “props” for filming. Jenny’s friend, Amy had graciously donated the use of her home for the afternoon. I arranged food, beverages, and DESSERTS in Amy’s kitchen and livingroom while Jenny prepped her intro and Cliff set up his equipment. This is where the MAGIC started to happen. As we four women began enjoying the munchies and serving up the chocolate brownie cheesecake – with whipped cream and strawberries, naturally – we started to chat. Talk turned into REAL CONVERSATION which sparked LAUGHTER and eventually moved straight into FUN. Before any of us knew it, we were HAVING a Chick Night. It didn’t matter that I barely knew Jenny and had never before met Amy or Christine. It didn’t matter that we were all there to tape a tv segment. In that moment, we completely forgot about the camera guy hovering in the background. (Sorry Cliff.) Chick time simply HAPPENED. Four women + one chocolate dessert = FUN. That’s the aspect that most women seem nervous about. The dreaded HOW? 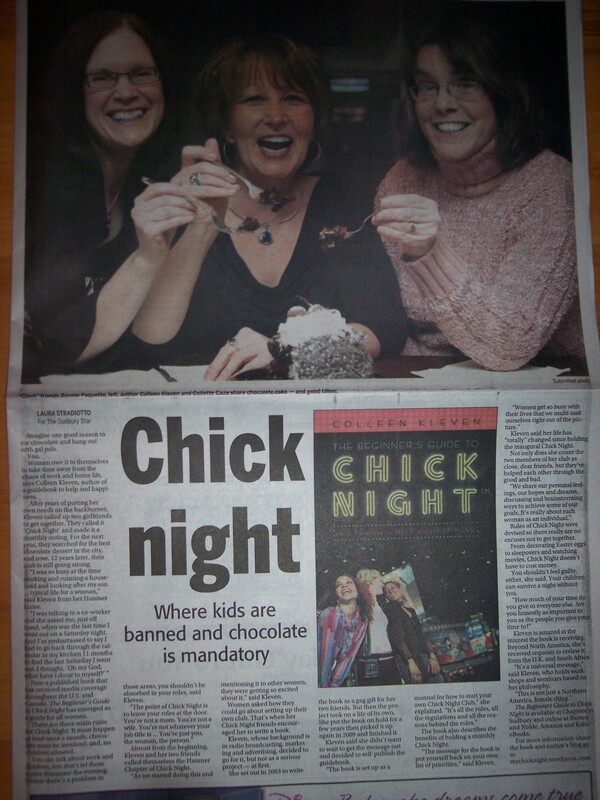 Ladies, please believe me when I say…Chick Night will happen…if you LET IT HAPPEN. 1. DECIDE what YOU would like to do. You may want to go out for dinner or host a potluck meal. You may prefer to see a movie at the cinema or rent a DVD. You might feel like going out hiking or biking or snowshoeing and coming back for hot chocolate. Or, the idea of doing arts and crafts together may appeal to you. 2. CALL or EMAIL two or three women you would like to spend time with. These can be girlfriends you haven’t seen in a while or women you barely know. 3. INVITE THEM to get together “just the girls”. Make it clear that there will be no spouses, partners, or children. Chick Night is your chance to get away from all your roles and responsibilities and just be YOU. This is YOUR night out. 4. MENTION the chocolate. Trust me, offering a woman a chance to TREAT HERSELF is like holding a magnet half an inch above an open box of paperclips! They will WANT to join you. 5. ENJOY yourself. It really is that simple. Jenny, Christine, Amy, and I managed to pull off a totally impromptu Chick Night in the middle of taping a tv segment. Just think of what YOU will be able to do with a little thought and a couple of emails! From what I understand, the term “BEING PRESENT” refers to focussing your awareness on what is happening right here and now. The trick is not to think about what happened yesterday or what may happen tomorrow. In his book, “The Power of Now”, Eckhardt Tolle explains that the simple act of being present will help REDUCE or ELIMINATE anxiety. It works because most of what you worry about isn’t actually happening in THIS moment. Tolle also says that being present INCREASES your ability to be GRATEFUL for what you have. That makes sense. You can’t be grateful for things you don’t NOTICE. It is this aspect of being present that I want to talk about. In the first days of 2012, I had a really powerful lesson in being present, and it quite aptly centres around a Zen waterfall. My son and I were fortunate enough to spend Christmas Day with my family this year. My brother David, his wife Young Oak, and my seven-year-old nephew Brett hosted Christmas in their new home. It was a GREAT day! My mom, my niece Candace, my nephew Andrew, and his girlfriend Shannon were also there. I was PRESENT (pun intended) every moment of Christmas Day – from waking up to the sound of Brett yelling “It’s Christmas morning!!! !”, to helping my mom stuff the turkey, to laughing all the way through dinner and dessert. As if that wasn’t good enough – after dinner, I saved over $120 by ordering a replacement Dell laptop battery through eBay! Between Andrew and his girlfriend, they know ALL the great places to order computer hardware and get FREE SHIPPING all the way from Hong Kong! Woohooo! Yes, I definitely managed to be present on Christmas Day. Unfortunately, my state of being faltered slightly very early in the New Year. 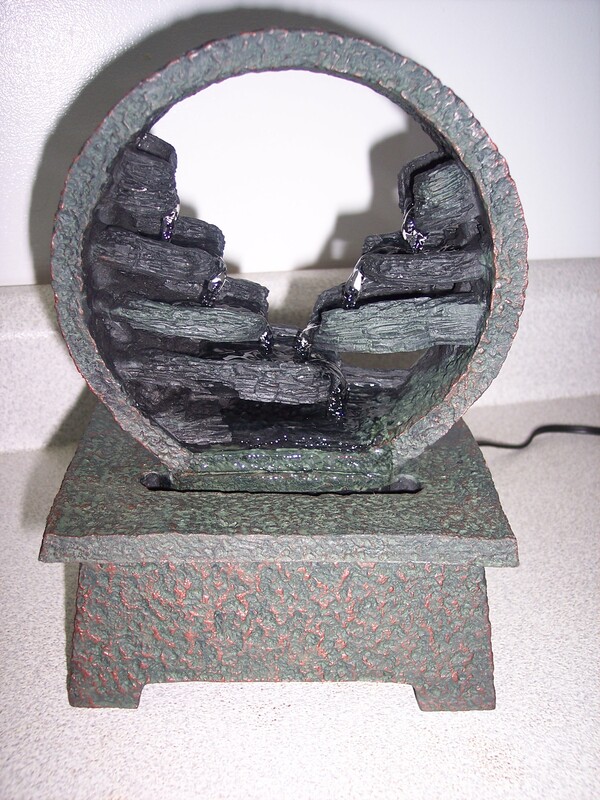 Andrew, that same wonderful nephew who is the computer whiz, gave me a Zen waterfall for Christmas. It’s the one pictured on this page. I was really excited about his gift but I didn’t get a chance to set it up. I drove back from Toronto on Boxing Day, threw my dirty clothes in the laundry, packed clean clothes, and headed to Ottawa for the CTV Morning Live interview that aired on Wednesday, December 28th, 2011. (You can see that on my Media TV page or on YouTube under My Chick Night). The interview went really well! Laurie, my BFF from high school, met me in Ottawa for a couple of days and then we drove back here. She stayed over for New Year’s – the SECOND year in a ROW, thank you very much! The day Laurie had to fly back to Toronto, I was definitely not being present. I was sad she was leaving and concentrating on when I’d see her again – instead of focussing on the fact that she was STILL HERE. In doing so, I wasted the time we were together that day by concentrating on the fact that she WOULDN’T be here the NEXT day. Do YOU do silly things like that? On that day, in order to keep from openly moping, I offered to help her pack. Oh, I HELPED allright. Without realizing it, I packed her stuff – and some of MY STUFF – into her suitcase. The next day, I TRIED to set up my brand new Zen waterfall. It’s a really simple arrangement of parts that I had already taken out of the box BEFORE leaving for Ottawa and set in a jumbled pile on my kitchen table. Surprise, surprise – now on January 3rd, I couldn’t find the adapter cord. It was ridiculous. It HAD to be here. Or did it? That’s when I clearly remembered scooping up EVERY adapter cord I could find and “helping” Laurie pack by shoving them all in her computer bag. The Universe has a great sense of humour, doesn’t it? While NOT being present, I did the one thing to ensure that I COULDN’T use my ZEN waterfall. Fortunately, I have since been to Toronto and retrieved the adapter cord. Thank you very much, Andrew. I LOVE IT! The waterfall is sitting on my kitchen counter as a TANGIBLE REMINDER of the importance of BEING PRESENT at all times. This morning started out GREAT…and the day keeps getting BETTER and BETTER. First of all, I woke up before the alarm went off. That may not sound like much to you – but it felt AWESOME to me. I love waking up a couple of minutes ahead of the time I set on my clock. That way, I awaken feeling totally refreshed rather than having been jolted out of a sound sleep. Waking up gently is such a TREAT. Now that we have established the fact that I am NOT a morning person, I want it on record that I have the UTMOST RESPECT for radio personalities and newspeople who work the morning show. HATS OFF to all those men and women who get up at 3 or 4 o’clock in the morning and then CHEERFULLY help us greet the day! I am thinking in particular of morning show host, Bruce Wylie and morning show newsperson, Rhianna Robins who both interviewed me this morning on JRfm 104.9 in Brockville, Ontario. I want to say THANK YOU for a great interview. I would also like to acknowledge the calibre of their show – based on having talked to them, and on their enthusiastic and RESPONSIVE LISTENERS. Only moments after that live interview finished, one of their listeners posted a comment on the About Book page of my website. Leisa had been listening to her FAVOURITE morning show on her way into work and heard our chat. She felt INSPIRED by our conversation and wanted to LET ME KNOW it. Leisa’s willingness to TAKE THE TIME to let me know she found the concept of Chick Night inspiring meant a great deal to me. I truly hope she starts giving herself the gift of Chick Night very soon! In the meantime, she’s welcome to use the link on this page to DOWNLOAD a FREE chapter of my book to get some ideas on how to proceed. The more I hear from women, the more I want to continue spreading the word about Chick Night and about ways in which you can IMPROVE your quality of life. That’s why I do SPEAKING ENGAGEMENTS and WORKSHOPS and SEMINARS. It’s a great way to talk to as many people as possible all at once. JRfm morning show host, Bruce Wylie’s HOMETOWN is Hanmer, Ontario. Imagine his surprise when a copy of my book, The Beginner’s Guide to Chick Night, landed on his desk and he saw the HANMER chapter of Chick Night mentioned on the back cover! As if that wasn’t enough…Angela Gemmell, a friend of mine who happens to be the newsperson at EZ Rock, Sudbury…used to WORK WITH Bruce Wylie at JRfm in Brockville. Yes, yes, it’s a small world…filled with WONDERFUL PEOPLE. I’ve always been FASCINATED by the patterns created on the surface of water when something breaks through that first layer of water tension. I’m talking about those CONCENTRIC CIRCLES that form when you drop a pebble into a pond. LIFE works the SAME WAY. One single action or event will begin a pattern that ripples outward. For example, in early December of 2011 (yes, that would be LAST YEAR), I received a call from John Kretzschmar, Founder/Publisher/Editor of The Valley Meteor (www.valleymeteor.com), a locally owned and operated paper for the community of Valley East. Kretzschmar interviewed me for the December issue of the paper. 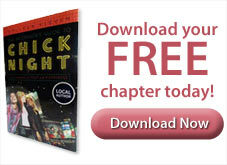 In the article, he graciously recommended my book, The Beginner’s Guide to Chick Night, as a gift for out-of-town friends and family members. We had a great conversation. In addition to the interview, Kretzschmar and I discussed the career paths that had led him to start a newspaper and me to write my first book. Don’t you LOVE finding out HOW people got from “there” to “here”? She wanted to do an interview in my home. When she and her videographer, Terry arrived, we sat in my kitchen and talked about ways for women to enjoy the holiday season – even if they are HOSTING the “main event”. Off-camera, we had a great chat about Christmas prep and about our children. What a nice way to spend a morning! She was interested in doing a story on my book. We talked about it and about ways for moms to reduce holiday stress. While we were chatting, Peck mentioned that she was originally from Stoney Creek and had chosen to live in Parry Sound. I told her that I had moved to Northern Ontario after growing up in Toronto. In comparing our experiences, we discovered HOW MUCH we have in common. Within two weeks, the ripple effect had moved from LOCAL community paper to MUNICIPAL tv station to REGIONAL newspaper. One week after VERY EXCITEDLY (I distinctly recall jumping for joy) opening an email from Kent Mannen, Producer of CTV Morning Live in Ottawa, I found myself sitting in their George Street studio on Wednesday, December 28th being interviewed by Host, Lianne Laing. What a FABULOUS experience! 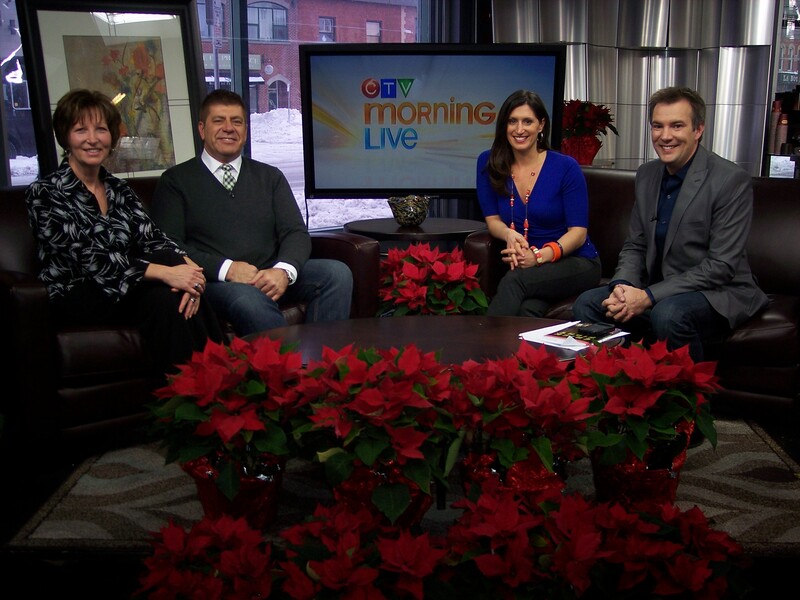 Hosts Lianne Laing, Kurt Stoodley and Jeff Hopper went out of their way to make me feel welcome. For that, I am equally grateful! By the way, under the “It’s a Small World” category…not only did Jeff Hopper and I take the same Radio Broadcasting course at Humber College in Toronto (he was there a “few” years after I was) but one of the women in MY class, Louann Nicholson, was later one of HIS instructors! CTV Morning Live in Ottawa was my first PROVINCIAL (and thanks to the wonders of satellite tv) also NATIONAL tv interview. How fitting that it took place in Ottawa, our nation’s capital. Prior to the interview, Laing and I had a chance to talk about our children and the ways in which we make sure to stay connected with our girlfriends. I was “preaching to the choir” with Laing. She GETS it! Since that interview found its way to YouTube, I’ve had lots of great feedback. Of all the comments, perhaps my favourite was from my seven-year-old nephew, Brett. He asked me why I “didn’t look at him” during the interview. I will tell you the same thing I told him. Just before the interview started, the host very politely asked me to look at HER instead of at the camera – a perfectly logical request considering the fact that we were having a conversation. As I sit here on Day Three of 2012, I wonder where the ripple will go NEXT. It’s a brand new year. I’m aiming for the ELLEN Show and the OPRAH Network. What are you going to do with YOURS? Make your plans and follow your dreams. If you need any coaxing, DOWNLOAD a FREE chapter of my book. The link is in the top right-hand corner of this page. Every new author longs for media attention of his/her book. It’s how we let people know the book exists! The unexpected perk of my book launch has been how many people I’ve had the opportunity to talk to! That includes everyone from editors, reporters, and bloggers to family members, friends, neighbours, and colleagues. People really LIKE to talk about books. Whether or not they have any aspirations of writing their own book, everyone has READ a few. Men and women get such a kick out of the idea of “knowing a published author”. In return, published authors get a kick out of people being excited for them. I got the BIGGEST kick out of my Aunt Betty’s Christmas card. My Uncle Lloyd and Aunt Betty live outside of Ottawa in Manotick. I haven’t seen them in ages but I have FOND MEMORIES of spending time with them – and my cousins David, Shelley, and Lianne – during the Thanksgivings, Easters, and Christmases of my childhood. What a HOOT! It’s my favourite Christmas card so far. The more I talk to people, women in particular, the more I realize how truly connected we are, and how well we can relate to being a Chick. There is a bond women share – regardless of the life stage we happen to be in or the life circumstances we happen to have experienced. On the surface, we recognize our connection through gender but I think it goes DEEPER than that. We really are CHICKS AT HEART. If you’re not sure what I mean, allow me to describe the great chat I had with Laura Stradiotto, the reporter who interviewed me for the Sudbury Star article. I’ve never met Laura. We don’t have any mutual friends – at least none that came up in conversation. When Laura dialled the phone for our call, the only thing we had in common was that she was about to put together a newspaper article about my book. She had a list of questions she needed to ask me – which I answered. The call could probably have been accomplished within 10 minutes, however within the first 5 minutes, Laura and I had made a connection. The more I described the philosophy of Chick Night, the more obvious our connection became. Laura instantly related to the desire to be more than the sum of her roles. Don’t get me wrong – she’s happy in her roles – she just wants to be ALL that she can be. That’s the whole point of this book. 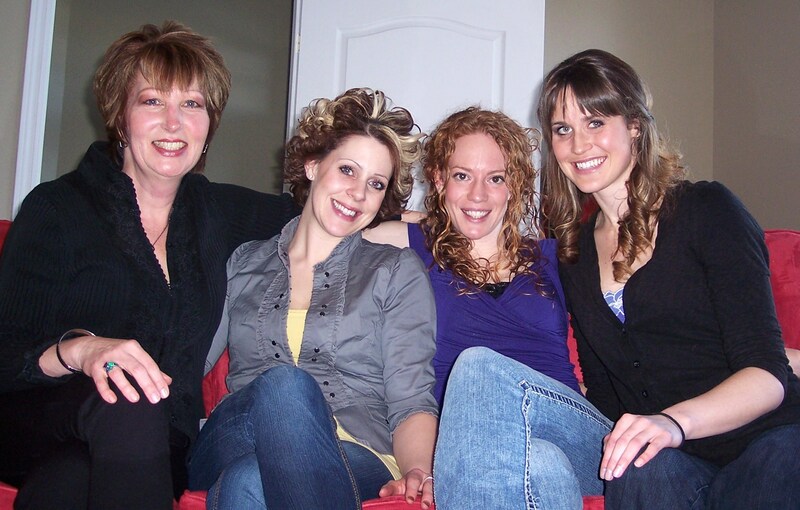 Encouraging women to seek the happiness and fulfillment that comes from a life full of interaction and connection inside their families and with their girlfriends – their Chicks. Chick Night is all about RELATIONSHIPS. Well okay, it’s about relationships, fun, and chocolate…but MOSTLY it’s about relationships. Here I sit at Kal Tire, wondering why the heck I forgot to get my summer tires switched for winter tires BEFORE the first snowfall. Calendars, schedulers, and daytimers work really well – when you remember to USE them. After having lived in Northern Ontario since 1980, it is more than a little embarrassing to admit that, unless I write this stuff down, the arrival of winter catches me by surprise EVERY YEAR! Okay, I’ll be honest. I KNEW winter was coming. I just didn’t want to look for it. Now I can no longer IGNORE the fact that summer is over, fall is over, and it will be several long months before spring arrives. I am not particularly fond of winter. As far as I am concerned, it isn’t even first or second runner-up. SPRING is my favourite season. Spring is the time of year when I can stare into the distance and see nothing but the promise of warm, sunny days ahead. Besides, the FLOWERS are starting to come back – and who doesn’t love flowers? Even though I’m allergic to pollen, I still love flowers. The fact that I have to hold my breath around SOME of them doesn’t change anything. Besides, the itchy eyes and runny nose are vague memories at this time of year. Who remembers any details about ragweed season when there’s snow on the ground? Right now I can only long for those first glimpses of crocuses and hyacinths and tulips and daffodils poking out of the ground. Lilacs instantly transport me back to my childhood. I grew up with a lilac bush underneath my bedroom window. At night, with the window wide open, I would fall asleep smelling their fragrant blooms. To this day, no matter what I am doing or how busy I am, catching a whiff of lilac in the air will stop me in my tracks. Lilacs don’t just stop me – they trigger an overall body shrug of relaxation that instantly pastes a big smile on my face. Snow doesn’t do that. Well, not for ME. What is YOUR favourite season? Is it about what you can do in it or what it represents to you? I have a tendency to do things THE HARD WAY. Perhaps this is because I have such high expectations of myself and my work. I want the finished product to be BETTER than anyone is expecting. For this reason, I avoid tasks I can’t perform very well – like sewing. (My idea of HEAVEN is hemming with a glue gun). Or, I spend far more time on them than I probably needed to. Over the past two-and-a-half weeks, the SCHOOL OF LIFE has tried to point this out to me a minimum of THREE TIMES. I did a one-hour workshop on Letting Go of Grief at the IWannaFeelGood Conference 2011 two weekends ago. Believe it or not, I spent THREE DAYS prepping for a sixty-minute presentation. The first version I put together would have taken me FOUR HOURS to deliver. The second version wasn’t much better. The only way I could have crammed that into an hour would have been to do my best impression of an auctioneer. With the exception of my PowerPoint slides – which consisted of a series of quotes that spoke to the various points I wanted to make – the scripted version I finally took with me to the conference IN NO WAY resembled the presentation I actually delivered. As I stood at the front of that room and looked at the audience, I finally realized that I had made my presentation way TOO COMPLICATED. This wasn’t supposed to be a university lecture. It was meant to be an HONEST DIALOGUE sharing my personal experiences and letting these women know how I had managed to get through the five stages of grief. In that moment, I decided to simply TELL MY STORY and explain the strategies that had worked for me. That’s exactly what I did, and the talk was very well received. Now, you would have thought that lesson was enough to teach me, wouldn’t you? Last Tuesday night I was keynote speaker at a DynamicWomen.ca Dinner. Organized and hosted by Dawn Larsen of Navigator Marketing & Business Solutions, this evening was designed to bring dynamic women (hence the club’s title) together to discuss ways in which they can enrich their business and personal lives. My talk was to be about the process of creating Chick Night, and the writing and publishing of The Beginner’s Guide to Chick Night™. Here again, I spent far more time than I needed to on that script. After all, I had simply been asked to TELL MY STORY again. As I stood at the front of that room and looked out at all those women, I realized they had not come here for a canned speech. They wanted interesting information and anecdotes about my experiences developing my Chick Night friendships and becoming a published author. During the course of that sixty minutes, I shared far more of my personal feelings and experiences than I had written in my speech notes. My willingness to speak freely was rewarded by a number of women in the audience who chose to share their stories and experiences during the question and answer period after my presentation. They talked about how they do their own versions of Chick Night, who they choose as girlfriends, and how often they get together. It was wonderful. You may be asking yourself why I chose to scrap a speech I had fully prepared? The answer is quite simply that in that moment, it FELT RIGHT to do so. I know that making decisions based on emotions is generally frowned upon in business settings, however I have always believed that trusting my instincts makes sense. My executive coach, Jennifer Welsh refers to this as “using all the tools in my toolbox”. Now, if I can just start using all my tools ALL THE TIME. These were two very powerful lessons and I honestly thought I had FINALLY gotten it. Alas, I needed one more. I used to cook a lot more often than I have these last five years. I’m actually a pretty good cook, although I tend to go for the simple, yet tasty dishes that take half an hour or less to prepare. For whatever reason, yesterday I decided that I would make beef bourguignon. Not just ANY beef bourguignon, I would make JULIA CHILD’S recipe. This is the one that takes more than an hour of preparation time, based on a set of instructions with a full ten steps. Then, it cooks for an additional four hours while you keep checking on it. This morning, I dutifully assembled all the pots, pans, cutting boards, knives, spatulas, and ingredients called for in this recipe. My kitchen counter was quickly covered with bags of onions, a pound of bacon I just finished cooking, my flour bin, a garlic clove, a carrot, a can of tomato paste, a bottle of red wine, three cans of beef broth, and assorted spices. With no time to lose, I pulled back the butcher’s brown wrapping paper from the package of stew beef I thawed overnight in my fridge. Then, and only then, was I reminded that the SCHOOL of LIFE likes to use HUMOUR as a teaching tool. Inside that brown paper wrapper is a pound of ground hamburger. I sure hope my son likes the hamburger-rice goulash he’s getting for dinner.